Dr. Tye is a Radiology Fellow and Dr. Desser is an Associate Professor of Radiology, Department of Radiology, Stanford University School of Medicine, Stanford, CA. A variety of infectious, inflammatory, neoplastic, and congenital diseases affect the small bowel, resulting in myriad clinical presentations that can often overlap. Computed tomography (CT) has become an indispensable tool for evaluating the small bowel in both the outpatient and emergency room settings, replacing the radiographic small-bowel follow-through (SBFT) examination in most instances. The development of multidetector CT (MDCT) scanners and their concomitant shorter scan times has further increased the utility of CT in evaluating vascular abnormalities affecting the small bowel because of the ability to scan multiple acquisitions during different phases of enhancement. The multiplanar capabilities of MDCT, along with the development of neutral enteric contrast agents, has facilitated the development of CT enterography as a useful tool for detailed characterization of inflammatory diseases and improved detection of small-bowel neoplasms. Many different techniques have been established for MDCT of the small bowel. At our institution, we routinely employ either a 16- × 1.25-mm or 64- × 0.625-mm detector configuration, reconstructing at 1.25- and 5-mm-thick axial sections for primary viewing. Coronal reformations are also routinely performed. 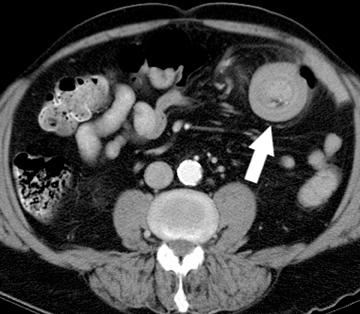 Intravenous contrast is routinely administered for standard MDCT of the abdomen/pelvis, in which small bowel pathology is suspected, unless there is a contraindication. We administer 150 mL of a 300-mg/mL iodinated contrast medium intravenously at a rate of 2 to 3 mL/second. Scanning commences during the portal venous phase, after a 70-second delay. High-density enteric contrast is not typically administered for our routine CT scans for several reasons. First, the presence of water-density fluid in the bowel lumen is preferred when intravenous contrast has been administered, as this maximizes visualization of mucosal enhancement patterns, which are of critical importance in cases of bowel ischemia and a number of inflammatory conditions. 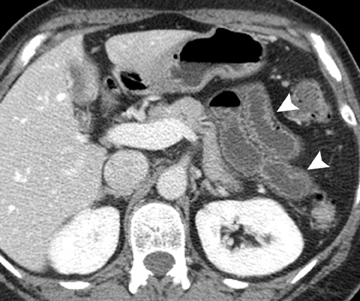 High-density contrast can also obscure intraluminal lesions, such as gallstones in cases of gallstone ileus. Second, imaging cannot commence until 1 to 2 hours following the administration of positive enteric contrast in order to ensure adequate opacification of distal small-bowel loops—a delay that is often not feasible in the emergent-care setting. Positive enteric contrast agents, including barium sulfate suspensions and water-soluble high osmolar iodinated solutions, can be useful in a few situations, however. If intravenous contrast cannot be given, positive enteric contrast will facilitate delineation of the small-bowel loops and thus aid in distinction of bowel loops from surrounding soft-tissue structures. Patients with ovarian malignancies routinely ingest positive enteric contrast agents prior to their staging/surveillance MDCT scans, which are also performed with intravenous contrast, in order to improve our ability to distinguish peritoneal tumor implants from normal small-bowel loops. Patients in whom there is high clinical suspicion for fistulaeor abscesses are also given positive enteric contrast prior to their studies for optimal detection and characterization of these entities. When there is high clinical suspicion for bowel ischemia, our MDCT protocol is modified to optimize visualization of the mesenteric arteries and any associated abnormalities. A CT angiogram is obtained using a bolus-tracking technique, with image acquisition occurring during the arterial phase of enhancement. The details of neutral enteric contrast administration for CTE vary slightly from institution to institution.1,7 but generally involve ingestion of a total of 1350 mL of Volumen, administered in three 450 mL portions at uniform time intervals beginning 45 to 90 minutes prior to scanning. 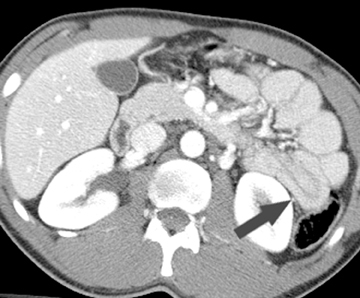 The timing of CT image acquisition relative to intravenous contrast injection is also modified in the CTE protocol, with images acquired during the “enteric” phase of contrast enhancement, after a 45-second delay (Figure 1). A number of congenital conditions affecting the small bowel can cause symptoms that come to clinical attention and which can be detected on MDCT. 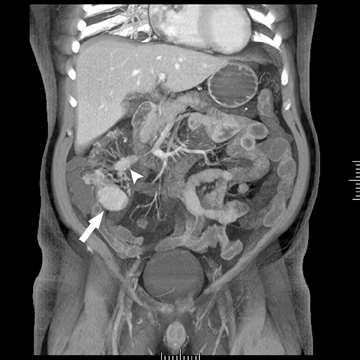 Some of these entities, including Meckel’s diverticulum, malrotation, and annular pancreas, are detailed below, along with their complications and associated MDCT findings. The primitive midgut undergoes a number of complex rotations during the first trimester of fetal development in order to establish its finalnormal position, followed by peritoneal fixation of the broad-based small-bowel mesentery, which extends from the ligament of Treitz to the ileocecal valve. A number of anomalies can occur when these rotations do not occur normally, including nonrotation, a spectrum of malrotation,and reverse rotation. Classically, a complete midgut malrotation presents in the neonatal period secondary to volvulus, with neonatal bilious vomiting. However, many individuals, particularly those with less severe degrees of midgut malrotation, may not present with symptoms until later in life, with a range of clinical presentations, from vague abdominal pain to intermittent symptoms of obstruction to malabsorption and weight loss, at which point, these patients are often evaluated by CT scan.18,19 Some may not develop symptoms at all, with the abnormal positioning of their bowel noted only incidentally on CT studies performed for other reasons.20 Given the risk of volvulus associated with malrotation of any degree, however, the recognition of these anomalies by radiologists is critical, even when patients are asymptomatic. Findings on MDCT in cases of bowel ischemia due to venous occlusion are typically different from those due to arterial occlusion, characterized by more pronounced wall edema, mesenteric edema, and interloop free fluid. Bowel-wall thickening in ischemia is typically symmetric, but can have various patterns of attenuation, including homogeneous hypodensity or a halo/target appearance. Mural hemorrhage is frequently seen as well in cases of venous ischemia, and can cause a heterogeneous attenuation within the bowel wall due to areas of hemorrhage juxtaposed with areas of edema and hypoperfusion.32 Venous occlusion can be seen in patients with an underlying hypercoagulable state, or may be due to a complicated small-bowel obstruction, an infiltrative neoplasm, or an infection. Occasionally, a thrombus can be directly visualized within the affected mesenteric vein as a hypodense filling defect that may expand the vein. The gastrointestinal tract is involved in 50% of patients with vasculitis. Vasculitides involving the large vessels include Takayasu arteritis and giant cell arteritis. Medium vessels are affected in polyarteritis nodosa, typically seen in older females, and Kawasaki disease, a pediatric disease. Systemic lupus erythematosis (SLE), Henoch-Schonlein purpura, and Wegener’s disease affect small vessels and are typically seen in younger patients. These vasculitides cause ischemia at unusual sites, such as the stomach and duodenum, as well as the small bowel and the colon. Infarcts in other organs, such as the kidney and spleen, are often seen as well. Bowel ischemia in these patients is secondary to narrowing and occlusion of small mesenteric arteries, resulting in long segments of diffuse, marked bowel wall edema, and hemorrhage(Figure 4). Chronic mesenteric ischemia is also known as “intestinal angina” and results from inadequate blood flow to the bowel, typically in the setting of underlying atherosclerotic disease in elderly patients causing significant occlusion or narrowing of the celiac axis, SMA, and/or inferior mesenteric artery. Symptoms typically occur in a postprandial setting, when increased splanchnic blood flow demand is greater than the blood supply available from the diseased arteries. Chronic mesenteric ischemia is often suspected based on the clinical presentation, in conjunction with arteriographic evaluation of the splanchnic vessels. Small-bowel obstruction (SBO) is a common cause of abdominal pain, accounting for 4% of all emergency room visits for abdominal pain and 20% of surgical admissions. Rapid diagnosis and identification of complicated cases, such as closed-loop obstruction, volvulus,or superimposed ischemia, are of critical importance, as these patients require emergent surgical management. At our institution, MDCTis routinely performed for the evaluation of suspected SBO, having essentially replaced the small-bowel follow-through examination and sometimes even plain radiography as the initial examination of choice. The second most common cause of SBO is hernias, which are most commonly external but may also be internal. There are several typesof external hernias, including but not limited to inguinal, femoral, umbilical, ventral, obturator, lumbar, and Spigelian hernias, all of which occur at points of structural weakness in the abdominal or pelvic wall musculature. These areas of weakness may be iatrogenic in nature,such as in the cases of parastomal, incisional, and laparoscopic port site hernias. When small bowel protrudes into these areas of weakness and becomes entrapped, passage of enteric contents proximal to this may become obstructed. A variety of inflammatory conditions of the bowel are well depicted on MDCT, although the manifestations can often be nonspecific, making a precise diagnosis difficult. However, a systematic approach to the interpretation of small-bowel abnormalities detected on CT can improve specificity in some cases. Patients with Crohn’s disease who present with an acute flare often demonstrate bowel wall thickening, with mural stratification that results in a target-like or “halo” appearance of the bowel. Bowel wall thickening is defined as a wall thickness >3 mm in a well-distended loop. The“halo” appearance refers to alternating layers of hyperdense mucosa, hypodense intramural edema, and hyperdense serosa (Figure 10). The presence of low-density intramural edema suggests an active inflammatory process. 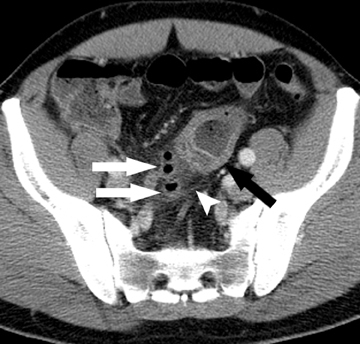 A more sensitive yet less specific indicator of active disease ismucosal hyperemia, which is optimally demonstrated on a CT enterography protocol. Luminal narrowing may be seen secondary to edema or spasm and is reversible at this stage, although it can be severe enough to cause an associated SBO.7With chronic inflammation, intramural fatdeposition can be seen, with fat attenuation seen within the thickened bowel wall rather than the water-density intramural edema seen with acute disease. Alternatively, chronic inflammation can also result in muscular hypertrophy, collagen deposition, and fibrosis, resulting in strictures that can cause small-bowel obstruction. Extra-enteric findings can also be helpful indicators of active disease. The “comb sign” (Figure 10) describes the engorged vasa rectae within the mesentery that run perpendicular to the bowel wall and correlates with more advanced, active disease that may warrant more aggressive medical therapies, given its correlation with more frequent hospital admissions.48 An increase in the density of the mesenteric fat surrounding an abnormal loop of bowel is a highly specific indicator of active Crohn’s disease and correlates with elevated C-reactive protein levels and histopathologic severity of disease.7 Fibrofatty proliferation, or fatty deposition along the mesenteric border of inflamed bowel segments, is highly specific for transmural inflammation secondary to Crohn’s disease, but can be seen with both active and chronic disease. Other important extra-enteric findings include abscesses and fistulas, as these may determine a need for surgical intervention. When abscesses or fistulas are suspected clinically, positive enteric contrast should be administered prior to the CT scan. Soyer et al in a retrospective analysis of their experience with CT enteroclysis in patients with suspected celiac disease, found that reversal of the jejuno-ileal fold pattern had the highest specificity for the disease (100%), but a sensitivity of only 63.6% (Figure 11). Other findings that were strongly correlated with celiac disease included ileal-fold thickening, vascular engorgement, and splenic atrophy.50 Intussusception can be seen in celiac sprue due to hypertrophied lymphoid tissue acting as lead-points. Lymphadenopathy is often present as well. Patients with celiac disease are also at increased risk for development of small-bowel adenocarcinomas and lymphomas, and the bowel should be carefully evaluated for evidence of tumoron MDCT. Radiation administered in the course of cancer therapy can cause both acute and chronic inflammatory changes in any bowel loops included within the radiation port. Radiation enteritis is characterized by segmental areas of abnormal bowel wall thickening. Chronic radiation enteritis can result in development of homogeneously enhancing scar tissue within the bowel wall, similar to that seen with fibrotic changes in chronic Crohn’s disease.32 Given the somewhat nonspecific findings, knowledge of the clinical history and note of the location of the abnormal small bowel within the site of previous radiation are critical to a confident diagnosis. Primary neoplasms of the small bowel, both benign and malignant, are rare. They are also difficult to diagnose, as direct visualization of most of the small bowel is not possible with conventional endoscopic procedures. Capsule endoscopy has been increasingly used, but its utility is controversial. 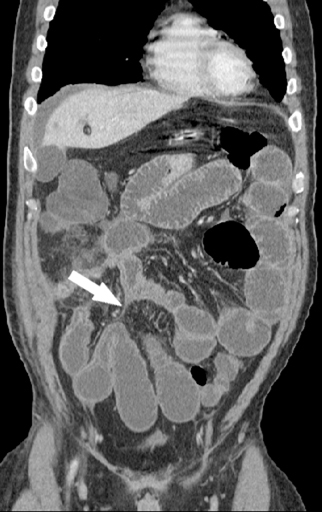 Double-contrast enteroclysis has been considered the test of choice for evaluation of the small bowel, but its required technical expertise and invasiveness are drawbacks.51 MDCT, particularly with the CT enterography protocol, has improved the ability ofCT to detect small-bowel tumors, and provides the added advantage of characterizing the extraluminal extension of disease. A detailed description of the wide variety of small-bowel neoplasms is beyond the scope of this paper, but can be found in a number of previous publications.51,52 Benign neoplasms include leiomyomas, gastrointestinal stromal tumors (GIST), lipomas, adenomas, and hemangiomas. A number of polyposis syndromes also affect the small bowel; they include familial adenomatous polyposis, Peutz-Jeghers syndrome, Gardner’s syndrome, juvenile polyposis, Cronkihite-Canada syndrome, and Cowden’s disease. Malignant tumors account for up to 70% of small-bowel neoplasms. Adenocarcinomas are the most common of these, occurring most often in the duodenum, followed by the proximal jejunum. Risk factors for adenocarcinoma include celiac disease, Crohn’s disease, and familial adenomatous polyposis. 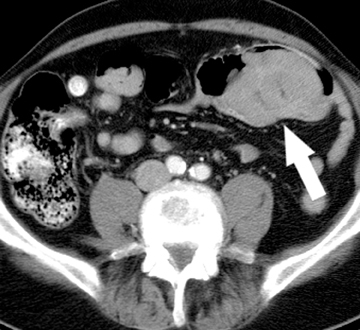 The CT appearance of adenocarcinoma can vary, but typically a focal segment of asymmetric bowel-wall thickening is seen, with moderate, heterogeneous enhancement and areas of mucosal ulceration. Extension through the serosa into the adjacent mesentery can be evaluated on CT, as well as the identification of metastases to lymph nodes and solid organs. Adenocarcinomas often narrow or occlude the bowel lumen and can cause obstruction, which can also be characterized on MDCT. The second most common malignant neoplasm in the small bowel is the neuroendocrine, or carcinoid tumor, which originates from enterochromaffin cells. Fifty percent of neuroendocrine tumors are located in the appendix, with the second most common site being the ileum. Although they are hypervascular, these tumors are often small and difficult to identify on routine CT, although CT enterography may increase their conspicuity. 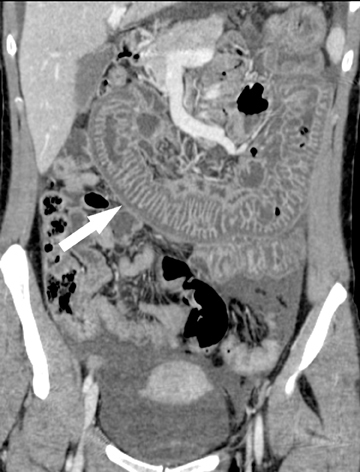 Nodal metastases incite a desmoplastic reaction within the mesentery, resulting in a mass-like density with spiculated margins,calcifications, and marked tethering of adjacent bowel loops (Figure 1). This desmoplastic reaction is more easily detected on CT and can helpin establishing the diagnosis. Patients often present with fairly advanced disease, after the development of flushing, diarrhea, and intermittent hypertension. These symptoms of the “carcinoid syndrome” occur when liver metastases are present. Neuroendocrine metastases to the liver are hypervascular lesions that are best detected during the arterial phase of enhancement. Lymphoma is the third most common malignant neoplasm of the small bowel and may arise from mucosa-associated lymphoid tissue (MALT). A systemic lymphoma can also affect the small bowel. Lymphoma has a variety of appearances on CT, ranging from a short segment of symmetric bowel wall thickening to a solitary mass infiltrating the surrounding mucosa to multifocal enhancing mucosal nodules.Secondary obstruction is uncommon, although intussusception can be seen. Lymphoma most often affects the ileum. While most GISTs are benign tumors, they also have the potential for malignant transformation. No radiologic imaging findings other than metastatic disease can reliably differentiate benign from malignant disease, and thus, surgical resection of all GISTs is recommended. These mesenchymal tumors are more common in the stomach, but can occasionally be seen in the jejunum, where the typical appearance is that of an exophytic, bulky mass, often with areas of central cavitation and calcification. Metastases to the liver, in contrast to neuroendocrine metastases, are generally hypodense. One of the most important MDCT findings in cases of small-bowel injury is free fluid in the absence of obvious visceral organ injury. Enteric fluid in the peritoneal cavity secondary to bowel injury can be of water-density if there is no associated hemorrhage and no administration of enteric contrast. The presence of free fluid in the peritoneal cavity in the absence of an obvious solid organ injury generally warrants further evaluation with exploratory laparoscopy.53 Small amounts of free, water-density fluid are often seen in menstruating females, however, and should be interpreted with caution. It is worthwhile to note also that very small amounts of simple free fluid can rarely be seen in a male, deep in the pelvis, even without any obvious traumatic injury on surgical exploration.53 However, generally, even small amounts of free fluid are abnormal in males and should raise suspicion of visceral organ injury. Bowel wall thickening can be seen with tramatic injury to the bowel in 45% to 75% of cases (Figure 12).53,54 It is important to distinguish underdistended bowel, which appears artifactually thickened, from truly thickened bowel. An isolated, truly thickened segment of bowel wallis likely due to an underlying contusion of the bowel.54 Abnormal enhancement is neither a sensitive nor specific sign of bowel injury, although occasionally patchy areas of hyperenhancement can be seen in areas of injury. When diffuse bowel wall thickening with diffuse mucosal hyper-enhancement is seen, this does not indicate injury to the bowel itself, but rather represents reperfusion injury to the bowel after a severe episode of hypotension (ie “shock bowel”) (Figure 13). 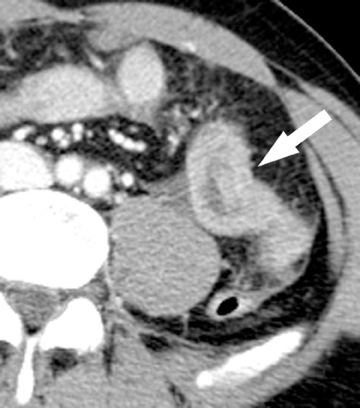 MDCT has become the test of choice for evaluation of known and suspected small-bowel pathology. Dedicated angiographic protocols can be used for investigation of occult GI bleeding or suspected ischemia. Enterography protocols have proven useful for evaluation of small bowel inflammatory disease, especially Crohn’s, and for detection and characterization of small-bowel neoplasms. MDCT has largely replaced the small-bowel follow-through as the preferred technique for evaluation of small-bowel obstruction, and is invaluable in numerous other clinical settings in which the bowel is the primary source of pathology or secondarily involved by other processes. Mazzeo S, Caramella D, Battolla L, et al. Crohn disease of the small bowel: Spiral CT evaluation after oral hyperhydration with isotonic solution. J Comput Assist Tomogr. 2001;25:612-616. Young BM, Fletcher JG, Booya F, et al. Head-to-head comparison of oral contrast agents for cross-sectional enterography: small bowel distention, timing, and side effects. J Comput Assist Tomogr. 2008;32:32-38. Kuehle CA, Ajaj W, Ladd SC, et al. Hydro-MRI of the small bowel: Effect of contrast volume, timing of contrast administration, and data acquisition on bowel distention. AJR Am J Roentgenol. 2006;187:W375-385. Megibow AJ, Babb JS, Hecht EM, et al. Evaluation of bowel distention and bowel wall appearance by using neutral oral contrast agent for multi-detector row CT. Radiology. 2006;238:87-95. Paulsen SR, Huprich JE, Fletcher JG, et al. CT enterography as a diagnostic tool in evaluating small bowel disorders: Review of clinical experience with over 700 cases. Radio-graphics. 2006;26:641-657;discussion 657-662. Olson DE, Kim YW, Donnelly LF. CT findings in children with Meckel diverticulum. Pediatr Radiol.2009;39:659-663;quiz 766-767. Nigogosyan M, Dolinskas C. CT demonstration of inflamed Meckel diverticulum. J Comput Assist Tomogr. 1990;14:140-142. Shinozaki S, Yamamoto H, Ohnishi H, et al. Endoscopic observation of Meckel’s diverticulum by double balloon endoscopy: Report of five cases. J Gastroenterol Hepatol. 2008;23:e308-311. Ludtke FE, Mende V, Kohler H, et al. Incidence and frequency or complications and management of Meckel’s diverticulum. Surg Gynecol Obstet.1989;169:537-542. Bennett GL, Birnbaum BA, Balthazar EJ. 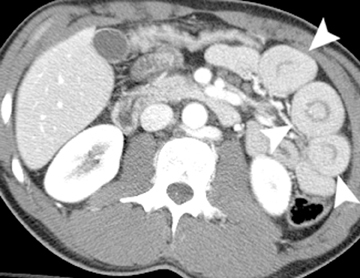 CT of Meckel’s diverticulitis in 11 patients. AJR Am J Roentgenol. 2004;182:625-629. Munroe CA, Copland A, Pai R, et al. Meckel’s diverticulum with gastrointestinal bleeding: role of computed tomography in diagnosis. Dig Dis Sci. 55:242-244. Russ PD, Friefeld GD, Nauck CJ, et al. Infarcted Meckel diverticulum detected by CT. AJR Am J Roentgenol. 1988;150:299-300. Ymaguchi M, Takeuchi S, Awazu S. Meckel’s diverticulum. Investigation of 600 patients in Japanese literature. Am J Surg. 1978;136:247-249. Leijonmarck CE, Bonman-Sandelin K, Frisell J, et al. Meckel’s diverticulum in the adult. Br J Surg. 1986;73:146-149. Turgeon DK, Barnett JL. Meckel’s diverticulum. Am J Gastroenterol. 1990;85:777-781. Green P, Swischuk LE, Hernandez JA. Delayed presentation of malrotation and midgut volvulus: Imaging findings. Emerg Radiol. 2007;14:379-382. Burke MS, Glick PL. 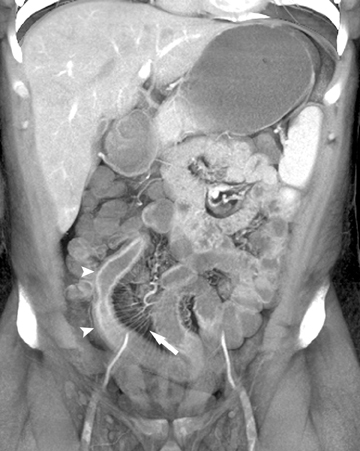 Gastrointestinal malrotation with volvulus in an adult. Am J Surg. 2008;195:501-503. Zissin R, Rathaus V, Oscadchy A, et al. Intestinal malrotation as an incidental finding on CT in adults. Abdom Imaging. 1999;24:550-555. Nichols DM, Li DK. 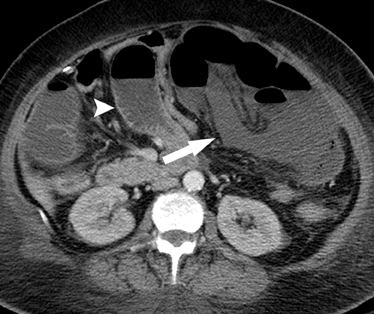 Superior mesenteric vein rotation: A CT sign of midgut malrotation. AJR Am J Roentgenol. 1983;141:707-708. Zerin JM, DiPietro MA. Mesenteric vascular anatomy at CT: Normal and abnormal appearances. Radiology. 1991;179:739-742. Chou CK, Mak CW, Hou CC, et al. CT of the mesenteric vascular anatomy. Abdom Imaging. 1997;22:477-482. Shatzkes D, Gordon DH, Haller JO, et al. Malrotation of the bowel: Malalignment of the superior mesenteric artery-vein complex shown by CT and MR. J Comput Assist Tomogr. 1990;14:93-95. Fisher JK. Computed tomographic diagnosis of volvulus in intestinal malrotation. Radiology. 1981;140:145-146. Duran C, Ozturk E, Uraz S, Kocakusak A, Mutlu H, Killi R. Midgut volvulus: Value of multidetector computed tomography in diagnosis. Turk J Gastroenterol. 2008;19:189-192. Sandrasegaran K, Patel A, Fogel EL, Zyromski NJ, Pitt HA. Annular pancreas in adults. AJR Am J Roentgenol. 2009;193:455-460. Jadvar H, Mindelzun RE. 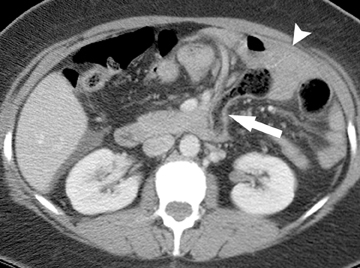 Annular pancreas in adults: Imaging features in seven patients. Abdom Imaging. 1999;24:174-177. Brandt LJ, Boley SJ. AGA technical review on intestinal ischemia. American Gastrointestinal Association. Gastroenterology 2000;118:954-968. Levy AD. Mesenteric ischemia. Radiol Clin North Am. 2007;45:593-599, x.
Zalcman M, Sy M, Donckier V, et al. 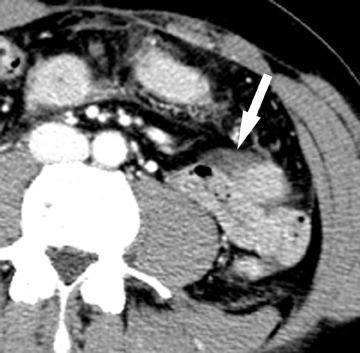 Helical CT signs in the diagnosis of intestinal ischemia in small-bowel obstruction. AJR Am J Roentgenol. 2000;175:1601-1607. Macari M, Balthazar EJ. 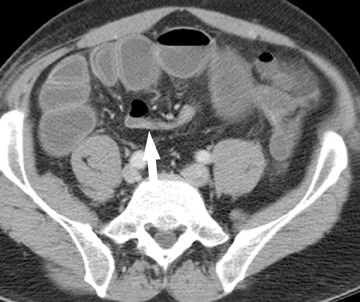 CT of bowel wall thickening: Significance and pitfalls of interpretation. AJR Am J Roentgenol. 2001;176:1105-1116. Wiesner W, Mortele KJ, Glickman JN, et al. 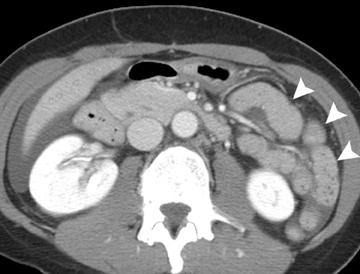 Pneumatosis intestinalis and portomesenteric venous gas in intestinal ischemia: Correlation of CT findings with severity of ischemia and clinical outcome. AJR Am J Roentgenol. 2001;177:1319-1323. Ho LM, Paulson EK, Thompson WM. Pneumatosis intestinalis in the adult: Benign to life-threatening causes. AJR Am J Roentgenol. 2007;188:1604-1613. Fuchsjager MH. The small-bowel feces sign. Radiology. 2002;225:378-379. Mayo-Smith WW, Wittenberg J, Bennett GL, et al. 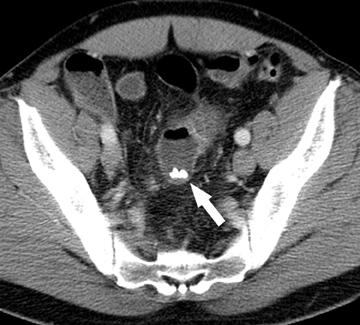 The CT small bowel faeces sign: Description and clinical significance. Clin Radiol. 1995;50:765-767. Jacobs SL, Rozenblit A, Ricci Z, et al. Small bowel faeces sign in patients without small bowel obstruction. Clin Radiol. 2007;62:353-357. Desser TS, Gross M. Multidetector row computed tomography of small bowel obstruction. Semin Ultrasound CT MR. 2008;29:308-321. Lazarus DE, Slywotsky C, Bennett GL, et al. Frequency and relevance of the “small-bowel feces” sign on CT in patients with small-bowel obstruction. AJR Am J Roentgenol. 2004;183:1361-1366. Lvoff N, Breiman RS, Coakley FV, et al. Distinguishing features of self-limiting adult small-bowel intussusception identified at CT. Radiology. 2003;227:68-72. Furukawa A, Yamasaki M, Takahashi M, et al. CT diagnosis of small bowel obstruction: scanning technique, interpretation and role in the diagnosis. Semin Ultrasound CT MR. 2003;24:336-352. Qalbani A, Paushter D, Dachman AH. Multidetector row CT of small bowel obstruction. Radiol Clin North Am. 2007;45:499-512, viii. 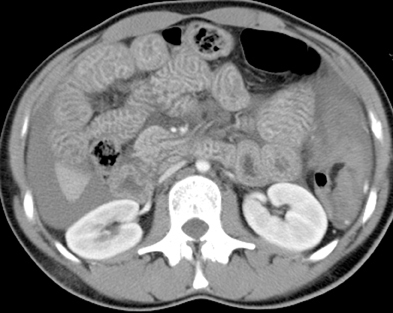 Orchard JL, Petorak V. Abnormal abdominal CT findings in a patient with giardiasis. Resolution after treatment. Dig Dis Sci. 1995;40:346-348. Puylaert JB, Van der Zant FM, Mutsaers JA. Infectious ileocecitis caused by Yersinia, Campylobacter, and Salmonella: Clinical, radiological and US findings. Eur Radiol.1997;7:3-9. Antonopoulos P, Constantinidis F, Charalampopoulos G, et al. 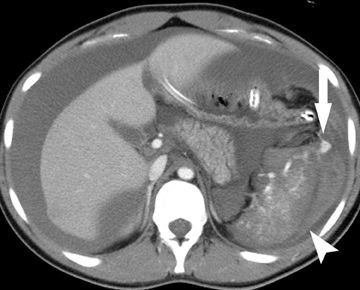 An emergency diagnostic dilemma: A case of Yersinia enterocolitica colitis mimicking acute appendicitis in a beta-thalassemia major patient: The role of CT and literature review. Emerg Radiol.2008;15:123-126. Wee B, Poels JA, McCafferty IJ, et al. 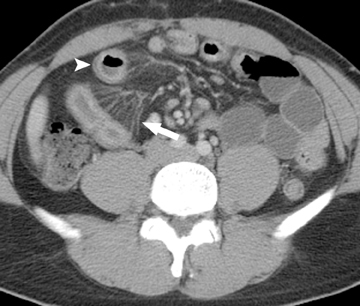 A description of CT features of Clostridium difficile infection of the small bowel in four patients and a review of literature. Br J Radiol. 2009;82:890-895. Horton KM, Corl FM, Fishman EK. CT of nonneoplastic diseases of the small bowel: Spectrum of disease. J Comput Assist Tomogr. 1999;23: 417-428. Lee SS, Ha HK, Yang SK, et al. CT of prominent pericolic or perienteric vasculature in patients with Crohn’s disease: Correlation with clinical disease activity and findings on barium studies. AJR Am J Roentgenol. 2002;179:1029-1036. Soyer P, Boudiaf M, Fargeaudou Y, et al. Celiac disease in adults: Evaluation with MDCT enteroclysis. AJR Am J Roentgenol. 2008;191:1483-1492. Soyer P, Boudiaf M, Dray X, et al. CT enteroclysis features of uncomplicated celiac disease: Retrospective analysis of 44 patients. Radiology. 2009;253:416-424. 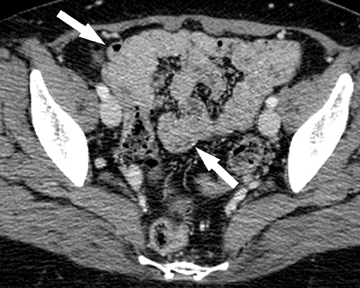 Sailer J, Zacherl J, Schima W. MDCT of small bowel tumours. Cancer Imaging. 2007;7:224-233. Ramachandran I, Sinha R, Rajesh A, Verma R, Maglinte DD. Multidetector row CT of small bowel tumours. Clin Radiol. 2007;62:607-614. Yu J, Fulcher AS, Turner MA, Cockrell C, Halvorsen RA. Blunt bowel and mesenteric injury: MDCT diagnosis. Abdom Imaging. 2011;36:50-61. 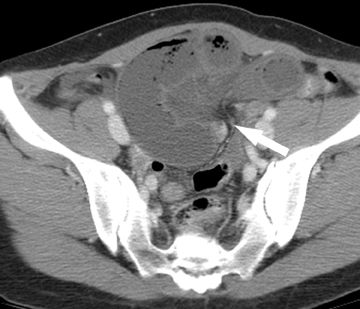 Brofman N, Atri M, Hanson JM, Grinblat L, Chughtai T, Brenneman F. Evaluation of bowel and mesenteric blunt trauma with multidetector CT. Radiographics. 2006;26:11191131. MDCT of the small bowel. Appl Radiol.